Time is the most important asset of our lives. Organising 24 hours of a day is a difficult task for some people. Every one has only 24 hours in a day. It’s only in your hands to spend it wisely and your success depends on it. From morning lectures to audit assignments, outstation audits, Homework,self study, seminars, office meetings, a CA article have to manage all in best way which is not possible without Time Management. 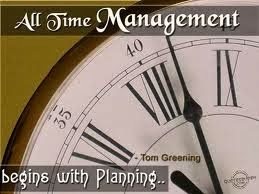 Here we are providing some tips which is essential for time management. First of all, we should know what Time Management is a type of self management which includes techniques, strategies, skills etc for organising the time with an aim to achieve efficiency in time utilisation. a. It helps to become aware of your time wasters. b. It helps to determine your priorities. c. It ensures that you have time for all the important activities. d. It helps in setting goals and achieving them. e. It helps you to structure your 24 hours of a day effectively. Preparing TO – DO – LIST:Using TO – DO – LIST will help you very much in controlling your tasks and keep yourself organised. Writing on a paper helps you to work on it and will help you in prioritizing your tasks according to you needs. Start Today:Do not delay your work. You are wasting lot of unnoticed time by this. So never procrastinate. Start your work today. Apply 80/20 rule: This rule states that 20% of your efforts account for 80% of your TO – DO – LIST. Some things have higher return than other. Invest your time and energy more in those activities. Learn to say NO: Some people become commit themselves for more and more tasks because of their inability to say NO. They waste time on some of the unimportant things. Learn to say NO to things which have low priority and invest your time to do important activities. Prioritizing: It is a process of deciding which tasks are more important of the several tasks. Priorities are decided by your goals and values. Determine your priorities by analysing the benefits, demerits of the tasks and how they help you to achieve your goals. Develop Speed Reading:Try to read with speed effectively. Use a pointer while reading. Learn where to slow and where to speed up. Effective reading will help you to remember the topic you may not require to repeat the study number of times. Divide your Work:Divide your big tasks into small manageable tasks. Each divided task should be completed with some breaks in between in your study. Procrastination: It is most important enemy to you. Delaying your day’s work will lengthen your time in achieving your goals. Lack of Self – Discipline: Self – discipline make you aware of the top most priorities. Lack of it may lead you into a state of jeopardy. Unexpected Events: These events include Drop in visitors, Distractions, Phone calls etc. They eat away lot of your time without notice. Ineffective Study: It means has to study number of times again and again to understand a topic. Stress: During articleship due to workload and hactic schedule many times we stressed up which ends in spoiling our routine & planned activities, which should be avoided by taking rest at appropriate intervals. Attempting to do too many things, this ends up in doing nothing. Inadequate planning: Solid planning should be done for each activity. there should be backup for each plan in case of failure of first plan.